This mammoth India Pale Ale is loaded with intense hop character and subjected to an extensive dry-hopping process. This IPA is unfiltered and as always, not pasteurized, leaving all the natural flavors intact. The Beer You’ve Been Training For. 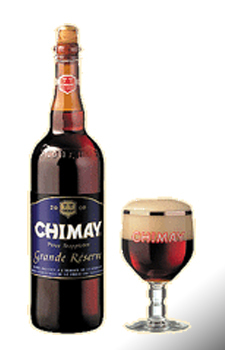 If you think that Magnum is just a Chimay Blue in a 51 fl. oz. bottle, you are forgetting one essential fact, for it is important to appreciate that a large volume of beer affects the development of taste in the second fermentation of the beer in the bottle and gives it a fuller and smoother character. A vintage like its little sisters of 11.2 fl. oz. and 25.4 fl. oz., Magnum Grande Réserve may be conserved in dark conditions for several years. This is how the beer acquires a light and pleasant taste of port. Convivial and festive, the Magnum is a must for the connoisseur who will not forget to serve his beverage at cellar temperature in “Gourmet” glasses 6 fl. oz. Named Grande Réserve in 25.4 fl.oz. bottles, it is principally distinguished by its character of a strong beer. This is a beer whose fragrance of fresh yeast with a light, flowery rosy touch is especially pleasant. Its flavor, noticed when tasting it, only accentuates the pleasant sensations perceived in the aroma , while revealing a light but pleasant touch of roasted malt. 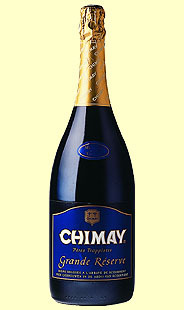 This top fermented Trappist beer , refermented in the bottle, is not pasteurized.